Although I’ve been sewing quite steadily over the past few years, this was really the first year I’ve made a significant number of garments for myself in quite a while, and, as it turns out, this has made me re-fall in love with sewing again this year. When I was spending most of my sewing time making things for others, it did allow me to stretch my skills and try new things, but it also sort of burnt me out on sewing. I’m happy to say that I’m so much more excited about sewing now than I was a few years ago, which is a positive looking towards the next year. However, I’ll save my goals and plans for 2018 until tomorrow; today is a retrospective look at what I’ve accomplished in 2017. Last year I made 81 items, but over half were home dec commissioned items, crafts, and small holiday gifts, and the majority of the rest were commissioned skating costumes. This year everything was much more involved garments, so I think I was actually more productive this year, even though the absolute number of items is quite far down. Certainly, the quality of what I’ve made has increased over the previous two years, so even if, in absolute terms the volume is down, I’m much happier with the items I’ve produced. It’s mostly tops and dresses, but otherwise it’s a fairly evenly distributed breakdown. I’d like to sew more pants next year, and more tops, but otherwise I’m pretty happy with the variety of what I’ve sewn. My output has been overwhelmingly BurdaStyle Magazine. I’m not surprised, Burda is my favorite. Aside from the magazine, the remainder of projects have been fairly well distributed among the other pattern companies, except Butterick, from which I haven’t made anything this year. Clearly, this is where the major issue lies, in that I haven’t worn nearly half of my garments. Though this, in part, is because of the items made for the Sewing Bee and Wardrobe Sudoku contests, it is something I need to work on moving forward. Typically I have some sort of goal or project I want to try to increase my skills each year. Interestingly, I didn’t focus much on improving any particular skills this year, but I’ve been watching more Craftsy classes, which has given me ideas and new techniques to try in my projects. In general I attribute my improved craftsmanship to general knowledge absorption and application. Having beautiful insides is something I’ve been wanting to achieve for a while now, and I think I’m working my way towards getting there. I definitely want to work on making neater pants innards (especially for unlined pants) next year, but on the whole I’m happy with the extra attention to detail I’ve put into my projects, and the results I’ve achieved by being more mindful about my finishing techniques. Although I have kept up with my pattern release blog posts over the past several years, this year it really felt as though I was able to reintegrated into the online sewing community. I never really left, but I hadn’t been as much of an active participant over the past few years. This year, though, I saw a large increase in my blog followers, had far more interactions with other sewists on social media and through blog comments, and got caught up on my other favorite sewing blogs. In terms of participating in the online community, my major venue was via Pattern Review contests. I entered the UFO Contest, the Wardrobe Sudoku Contest, the Sewing Bee, and the Stash Contest. 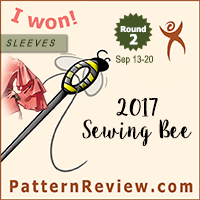 And I won my first ever Pattern Review contest with the Second Round of the Sewing Bee! I’m hoping to keep up my level of online participation next year. I’ve really enjoyed following various sewists on Instagram, and would love to participate in #BPSewvember next year, or perhaps Me Made May, or some other daily social media event. This year I attempted the #makenine on Instagram, but I’ve only managed to make 5 of the 9 garments I selected. Oh well, that’s what next year is for! Even more excitingly, though, next year I’m going to a sewing convention! Well, really more of a costuming convention, but I expect it will be full of people who love to sew. It’s called Costume-Con 36, and it’s a traveling national convention. However, next year I’m lucky enough for it to be held in San Diego – close enough to minimize travel expenses and to justify going. I’m sure I’ll post more about it in the months leading up to the con; I’ve got to decide what I’m going to make and how much I can execute in the next few months. Of course, not everything we sew can be the best thing ever, and I’ve definitely made a few things this year that don’t fall into the category of a “win.” While I’m fairly pleased with what I’ve made this year on the whole, there are a few pieces that just haven’t quite been my favorite makes. In my review I mentioned that I might gift this to a friend, which I did end up doing as an early Hanukkah gift. I did wear it once, and it was super warm and comfortable, but, in the end, I just wasn’t in love with the ruffles. My friend saw a picture of it and was obsessed, and she’s been wearing it every time I’ve seen her since gifting it. Certainly it has found a better home than with me. She is so pleased that she has actually asked me to make her some more. She’s practically family, so of course I will when we get some fabric. So really this was a stylistic experiment that was a fail for me, but in the end it worked out and everyone is happy. This top was made for my Sudoku Wardrobe contest entry. The style is great, and the fabric is great, but the fit is way off. Careful positioning made it serviceable for the contest entry, but really I need to go down 1-2 sizes. I’ve lost even more weight than when this was photographed, so at this point it is quite a bit too large. I’d definitely remake this in the proper size and likely wear it to death, but, as for now, my old McCall’s 6078 is still holding up. Ok, so I need to preface this by saying I love the fit, the fabric, and the construction on these culottes. Really, my only trouble has been in styling them. I think I just do not have a great culotte body shape, even though I love the way they look in the magazines. I love everything else about these pants though, so I’m keeping them. I did wear them over the summer, simply because they are comfortable, but I’ve begun referring to them as my “Hobbit pants” because that’s how I feel whenever I wear them. While this teal boucle jacket was supposed to be the centerpiece for my Wardrobe Sudoku contest, something about the cut of it just isn’t the most flattering. I keep trying to find ways to wear it or style it, yet I always take it off before leaving the house. I’m super happy with the construction, and the fabric is really pretty, but something about the shape isn’t working for me. I think, perhaps, it is the wide neckline, which doesn’t look quite right on my somewhat narrow shoulders. I haven’t given up on the idea of a boucle jacket, but I think this particular pattern isn’t going to be it. This dress was my entry for the UFO contest on Pattern Review. Although I was happy to finish it, in the end, the style really didn’t work for me. The fit wasn’t off really, but I never felt comfortable wearing it. The fit of the bodice was a bit weird, and the ruching, while pretty, makes me look incredibly boxy through the middle. The proportion of the waist seems odd as well. There was a reason it stayed as a UFO for so long. I still love this challis fabric though. Perhaps I’ll find a way to use it as a refashion if I don’t decide to just donate this dress. I can’t imagine myself actually wearing it, well, ever. I’m cheating a bit for my top five, but I’ve had a good year of sewing! Making this coat for my dad’s birthday gift was a great experience, and I think we are both really happy with how it turned out. Closet Case new-to-me indie pattern company, but I’m really pleased with the results of the Nettie dress! 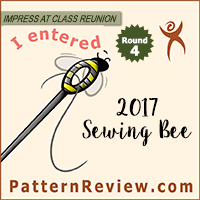 I used it for my winning Sewing Bee gown, but I also made this very wearable practice garment during the Bee, and I love the shape and fit of this pattern. Again this is sort of a cheat because BurdaStyle 10-2010-104 (left) and BurdaStyle 02-2014-129 (right) are completely different patterns. However, since I made them both for the Sudoku Contest, I’m going to milk it. I love both of these pants, from the fit to the style to the fabric. I’ve not had much occasion to wear either of them (the white is always a concern as far as getting dirty, and the corduroy has been far too warm for summer), but with holiday parties and cold weather approaching, I’m hoping to pull them out more this winter. Since I haven’t competed for the past few years, I haven’t had much cause to make new skating costumes for myself, but I really love the way these have turned out. They both had a podium moment as well, which was a wonderful way to return to competition after my injury and to cap off my skating season. I made this dress to wear to a wedding, and it was so fun to make an evening gown! I love the simple style and bright color. I’ll definitely be looking for an excuse to wear this again in the future. Another cheat, but if I’d had to choose these would have taken 4 of my 5 spots! I really loved the challenges this year, and I’m so excited with what I managed to create. While the Pink Floyd pencil skirt hasn’t really been a “wardrobe staple” I’m totally going to wear this when the appropriate event rolls around. The Round 2 Gown was a fun excuse to go nuts. I’ve not been the biggest fan of the sleeve trend, so I wasn’t mentally constrained by the idea of “wearability” and went wild. The reversible jacket is a complete 180 (yes, I said it), and definitely my most worn garment from the Bee. I love my Vogue jumpsuit, and my anteater jacket will be a sentimentally special piece, even if it isn’t what I’m grabbing on my way out the door each morning. The Bee was an adventure, but I loved every moment of it! 2017 has been a strange year. Personally, I’ve had a good year of skating and sewing, and I’ve been able to find contentment and joy in my hobbies and private life. However, in some sort of weird karmic balance, this has resulted in the perpetual feeling that the world is burning down around me. This, of course, is only partially due to the fact that California has been ablaze since mid-September, and has much more to do with the current political climate. Finding the balance between being an informed citizen of the world and a depressed lump of flesh capable of little more than consuming carby goodness on the couch has been tough. Several recent developments don’t have me holding out much hope for improvement in 2018, but I think that just makes me more determined to do better and find what joy I can where I can and when I can. With that I’m happy to look forward to the new year, and with it new adventures, new learning opportunities, and new possibilities. Your blog has been an escape from my daily stresses and has prevented me from becoming a depressed lump myself. Thank for you for a year of inspiration and detailed reviews. I hope you were not too affected by the fire. No we got through it ok! We did have to evacuate but everything was ok for us. Here’s to a better world in 2018! I’ve really enjoyed following your blog this year! Hope you have a great New Years, and lots of happy sewing (with less wildfires, literally and metaphorically) in 2018! Happy New Year to you. I really enjoy reading your blog. You are such an inspiration.